When fall has settled in around Parc national du Mont Tremblant in Quebec, Canada, the vibrant colors explode from the depths of the forest. While driving along Highway 2 through Parc national du Mont Tremblant in Quebec, Canada during the fall, the wilderness trees are ablaze in various hues. Red, orange, yellow and green colors explode along the roadside and carpet the hills and valleys during the fall. Spanning a distance of 1,510 square kilometers, Parc national du Mont Tremblant is home to lakes, streams, rivers, waterfalls and acres of forests. To see the colors of fall, one must visit the park during September and October to be able to enjoy the full effect of the season. Parc national du Mont Tremblant in Quebec is open year round with each season bringing a different perspective to the area. Summer is filled with activities such as canoeing, kayaking, swimming, fishing and hiking, spring opens the gateway to an abundance of flora, winter offers cross country skiing and snowshoeing and fall is the prettiest season of all when the trees change in color as they await the onset of winter. 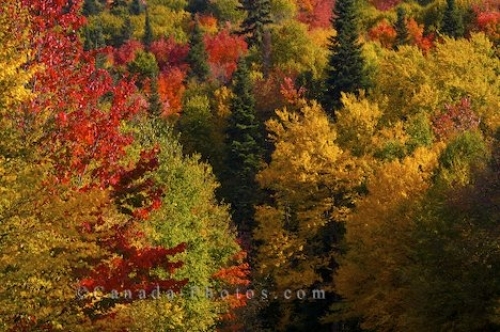 Picture of the fall colors decorating the wilderness in Parc national du Mont Tremblant in Quebec, Canada.